This Christmas Eve, head on down to IKEA for their unique and delicious Christmas Buffet. Dishes include the following + many more options onsite in IKEA’s cafeteria. A selection of cold vegetables, legumes, pickles and olives. Roast beef with vegetables, horseradish and fresh mozzarella cheese. Salad w/ seafood & rice noodles. Roast duck w/ berry jam. French fries with tomato salsa. Chicken & onion rings with tartar sauce. Roasted lamb chop with couscous and sour cream. Sausage served w/ red wine sauce. Roasted chicken drumsticks w/ black pepper sauce. Apple pie w/ vanilla cream. Coffee, tea or milk tea. Orange, grape or grapefruit juices. This huge spread of food is being offered on Christmas Eve ONLY from 5pm – 8pm. 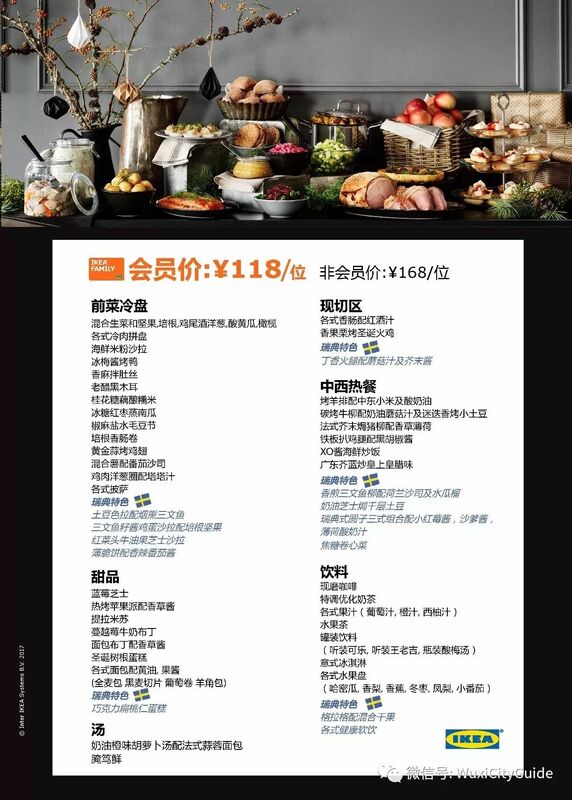 If you are an IKEA membership cardholder, the cost is 118rmb/pp. Non-members pay 168rmb/pp. Reservations must be made ahead by calling 18068281993 OR 15995270896. IKEA is located on the first to the fourth floors at the Livat Shopping Centre (荟聚) in Wuxi.